Do you remember the WAC Mechanic shoot I did with Thalita? Check them out at this link. Well, this time I had a great shoot with one of her fellow member of the MARS Reenactment association. His name is Luke and he is very passionate about these re-enactment activities. And that’s what you can see in these images. 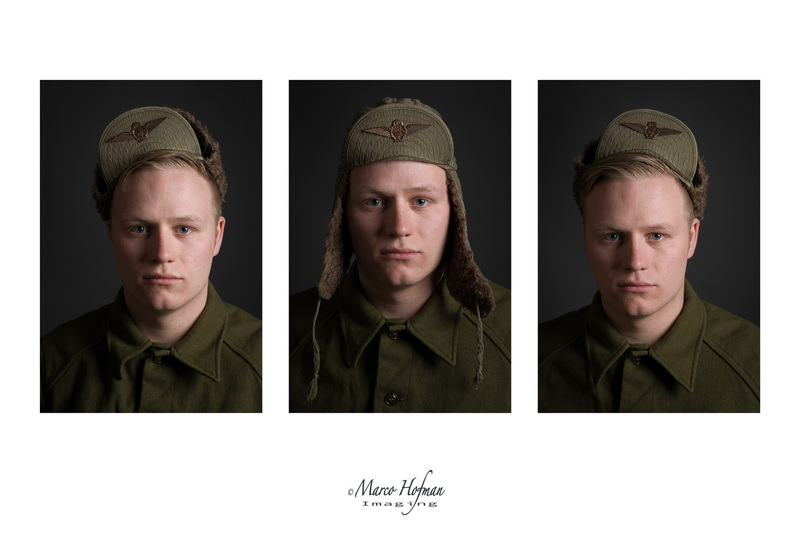 During the shoot we made images of Luke in different uniform types. Note that these are original uniforms from these days and no replicas. Ain’t that cool? 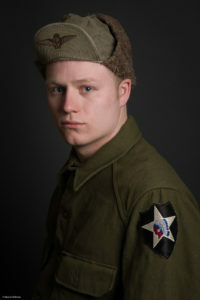 American M43 jacket with Dutch ranks of a second lieutenant and a Regiment Limburg name at the shoulder. The hat is an American garrisons cap with a Dutch lion. This uniform was used by the staff of Peter Zuid at the Regiment Limburg. 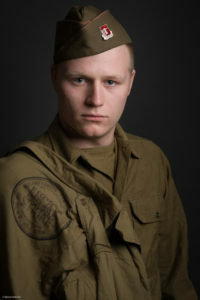 American M41 jacket with the symbol of the American second Armored Division. 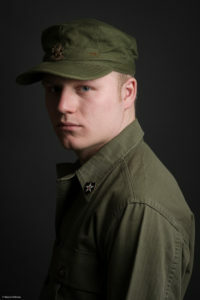 The shirt is an M36 wool blouse and the field hat is a Garrisons cap with engineers piping symbol. The M41 jacket even has a cool ‘Lucky Strike’ symbol on it which was created as a reference to Luke. 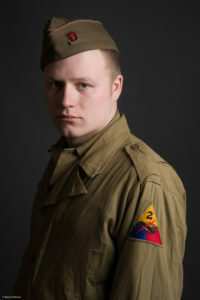 American M51 jacket with the symbol of the second Infantry Division. This was the army unit to which Dutch soldiers were assigned during the Korean War of 1950-1953. 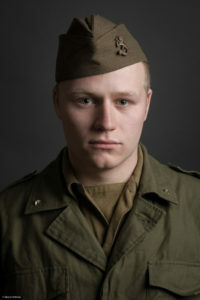 The winter hat is a pile cap with the wings symbol for paratroopers. The goal of the soldiers with that pile cap was to wear it in as crazy ways as they could. 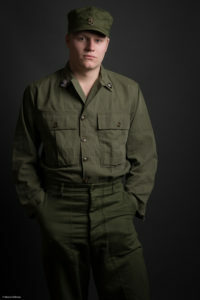 American M47 trousers and a HBT blouse. 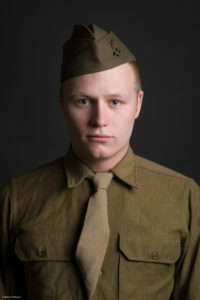 The collars of the blouse has two pins: one pin with the Indianhead of the second Infantry Division and a blue one of the 38th Infantry Division (which is a part of the second Infantry Division). 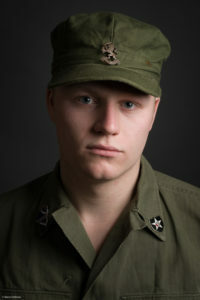 The hat is an M47 cap with the Dutch lion on it. 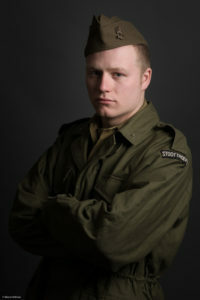 For the shoot I used one studio strobe with a 75 cm octabox. I wanted to create a more contrasty look because we are talking a tough guy here. So there was no fill in light required. Most of the time I used a Rembrandt style lighting. The shoot itself went flawless. Luke instantly knew what to do and took the right poses. Thanks Luke for having a great time. Pretty cool thing to remember and honor those who fought for freedom , the time and money spent to tell the story and keep it alive as it was and is. No added futures, no extra luxury ..living history or a living museum..just this short time ago, strange to know that germans still invade us on holidays as well we’ll go to germany without any hate ..bitter to see that groups of people in nl impose their will by disturbing children’s festivities ,changing names of schools, streets and buildings or ruin statues of our rich history of travelling the globe..however they are free of speech and to go wherever they want..they pretend to be victim of slavery in the 17th and 18th century…maybe a reenactment group will solve their problem thinking..